Entry-level laptops usually have just the bare minimum specifications, but they're powerful enough to handle most everyday tasks. Sometimes, compromises are made in order to accommodate otherwise expensive features such as a touchscreen, and sometimes style is more important than performance. Today, we also have an emerging category of tablets that run Windows and come with external keyboards so that they can be used productively when that's needed. In all this, it can be hard to decide which tradeoffs to accept and where the right balance lies. 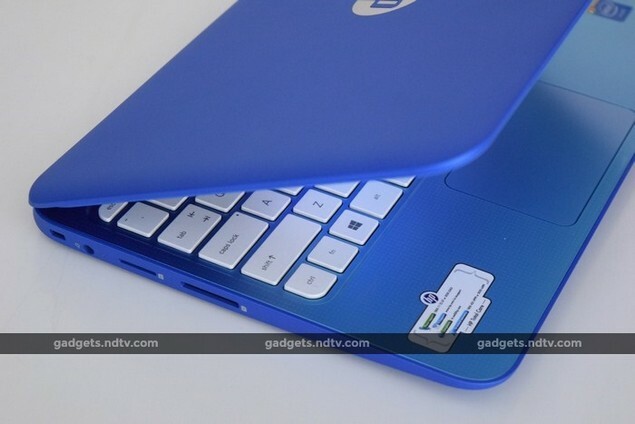 HP has come up with a device that gives us another option - the new Stream 11-d023tu. 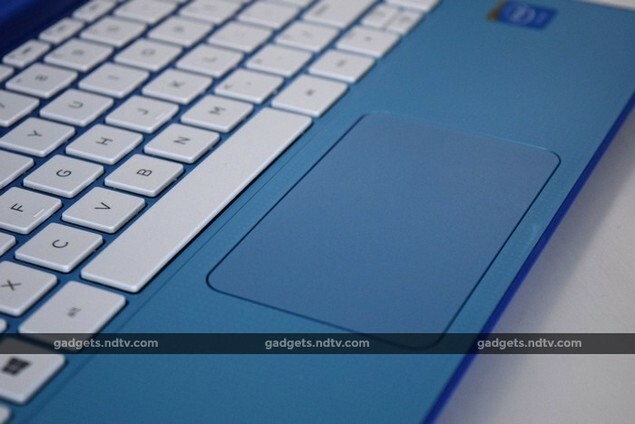 It's part of a series of devices that emphasise portability and connectivity, and so it breaks from the usual common standards that we take for granted when it comes to laptop specifications. The Stream lineup also includes a laptop with a 13-inch screen and a tablet with an 8-inch screen, but what we have today is the smaller clamshell model, the Stream 11. While it doesn't have any powerful hardware to boast of, it does have an integrated 3G modem. You can just pop a SIM card into a slot on the side and you'll be online without a Wi-Fi hotspot. That's a pretty unique feature, and is a lot more convenient than using a 3G dongle. 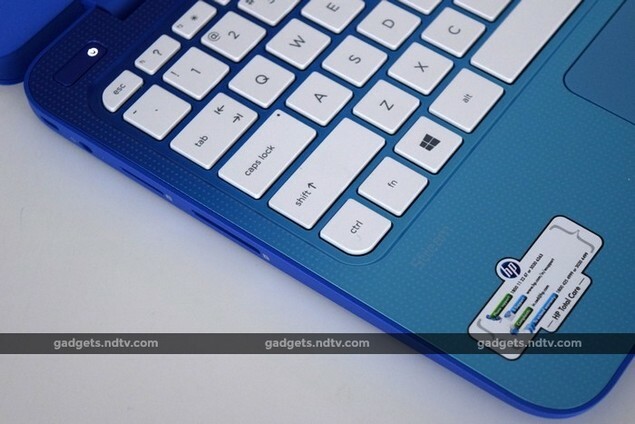 There's no getting around it: The HP Stream 11 is an eye-catching device, and not everyone will think this is a good thing, or that it's been done for the right reasons. HP has experimented with colourful pastels before, but the Stream 11 takes unusual design to a whole new level. 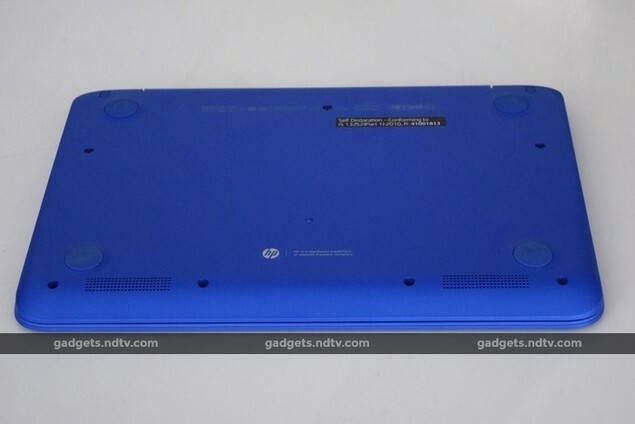 The entire exterior is a bright blue, except for a mirror-finished HP logo in the centre of the lid. The texture feels good, but it in our time with the device it picked up smudges, sweat and oil from our fingers very easily, and even got scuffed when being put into or pulled out of bags. However, the real shock comes when you open the lid - the keyboard deck has a bright blue gradient running from the back to the front and because that obviously wasn't unique enough, someone in HP's design studio decided to throw in a white polka-dot pattern as well. The keyboard keys are also white, and so there really is a lot going on when you look down at the lower half of this device. Sure, it stands out, but that really isn't always a good thing. HP says it was clearly meant to make the Stream 11 stand out in a crowd of black and grey laptops and that's certainly true. As with any design so distinct, there will be people who buy the Stream 11 for its looks alone and an equal (or greater) number who don't buy it even if they think it's a good product. There is no variant with a sober colour scheme. In fact there is a bright pink option in some markets, and HP is currently undecided whether or not to introduce it in India - so this is the company's idea of safe and neutral! Colour aside, there's not very much to see. All ports are on the right: one headset socket, one USB 2.0 port, one USB 3.0 port and an HDMI video output. That isn't a lot, considering this device isn't particularly slim. On the left, you'll find a Kensington lock slot, the power inlet, the SIM card slot (full size) and an SD card slot. The battery is sealed inside and there is no fan that needs vents, so there's nothing to see on the bottom. The stereo speakers are on the curve of the lower lip, so they fire forwards but downwards. The screen does not support touch input, and so it isn't covered with reflective glass. The matte finish is a relief, but the screen itself isn't of very high quality. 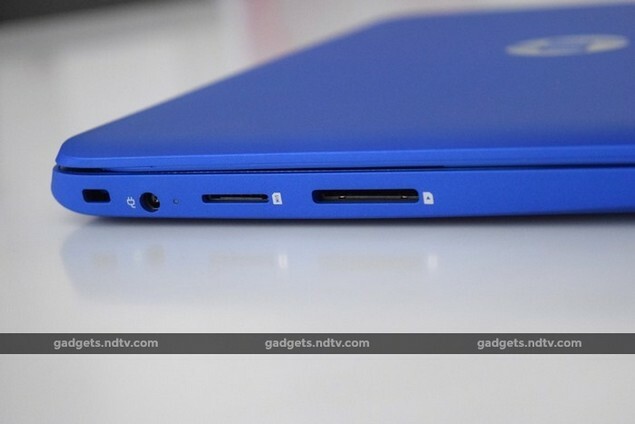 There's also a lot of blue plastic around it, which is the only part of the Stream 11 that makes it look a little childish, reminding us of devices such as Intel's Classmate PC. 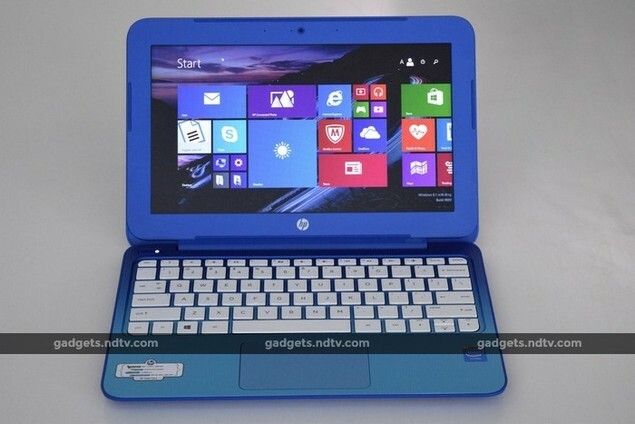 The HP Stream 11 is powered by a lowly Intel Celeron N2840 CPU, which is a dual-core model and runs at 2.16GHz. This particular processor is based on the Bay Trail architecture which is usually associated with low-powered Atom processors, not the Haswell architecture which powers most of Intel's desktop and laptop CPUs. There's 2GB of RAM, which is the minimum acceptable amount these days. 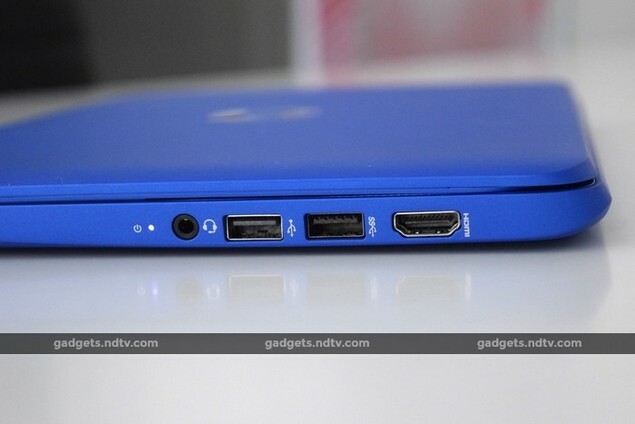 HP has cut a corner in terms of the amount of storage available. The Stream 11 has only 32GB of solid-state memory which is again more common of tablets than laptops. This is disappointing, and HP tries to explain it away by pointing out the ubiquity of cloud storage services today, and the fact that 32GB of flash is a lot faster than a spinning hard drive. Strangely, the SD card slot can only handle cards of up to 32GB, which is just ridiculous to us. SDXC capacity support would not have cost that much extra, and even tablets today allow for more expansion. With Internet access still too slow and expensive for anyone to rely on cloud services, buyers who need to store more than just a few documents will have to get used to carrying a portable hard drive around. The screen resolution is of course 1366x768, though that isn't too bad for an 11.6-inch screen. However the screen itself is not of very high quality. Viewing angles are not good, colours are dull, and it isn't visible enough under indoor office lighting unless you pump the brightness nearly all the way up. The keyboard is almost full-sized and typing comfort wasn't a problem. Only the arrow key cluster is cramped, as HP always insists on doing. The trackpad is large and responsive enough, but its mechanism is a little wobbly and the whole thing sinks a little when you touch it. The Stream 11 runs the 64-bit version of Windows 8.1 and comes with a one-year Microsoft Office 365 subscription, which includes 1TB of OneDrive space for the duration. McAfee LiveSafe is preinstalled and there are also a few spammy apps such as Tripadvisor, MySMS, The Weather Channel and HP's own Connected Music. We calibrated our expectations of the Stream 11 based on its low-grade Celeron, and our instincts turned out to be accurate. 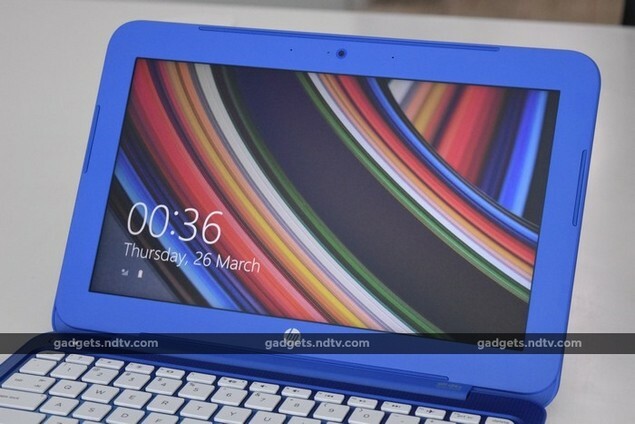 Performance was barely better than what we'd expect from a netbook or tablet. The Stream 11 booted very quickly thanks to the flash storage, but there were definitely times when the device lagged without even very much load. Menus took a second to pop up, programs didn't load very snappily, and the Windows 8 spinning-ring cursor made frequent appearances. That said, all other devices at this price level, regardless of size or shape, perform roughly the same. The benchmarks didn't surprise us much, except that both 3DMark and PCMark were unable to run to completion. Only PCMark's Home scenario finished and gave us a score of 1777 points, which was on par with entry-level laptops and tablets. POVray finished running in 30 minutes, 13 seconds while Cinebench gave us a CPU score of 70 (multi-threaded) - both scores well below those of the HP Pavilion 13-b102TU we reviewed a little while ago, illustrating the sort of tasks that are really crippled by the low-end processor. SiSoft SANDRA indicated favourable performance scores for the storage subsystem, which isn't a surprise. The processor came out looking weak, especially in non-accelerated tasks such as data encryption bandwidth. The one area in which the Stream 11 did do better than contemporary devices was battery life. Battery Eater Pro ran for 5 hours, 2 minutes before Windows automatically shut down, which should indicate that you can get a full workday's use out of the Stream 11 on a single charge. We definitely would not try to run even moderately demanding 3D games and programs on the Stream 11. For one, there would barely be enough space to install them, and beyond that they just wouldn't work well. A label on the hinge promises "DTS Studio Sound" and while the Stream 11 could get pretty loud without distorting, sound was not very rich or deep. Most of our test tracks, across musical genres, sounded tinny and harsh. 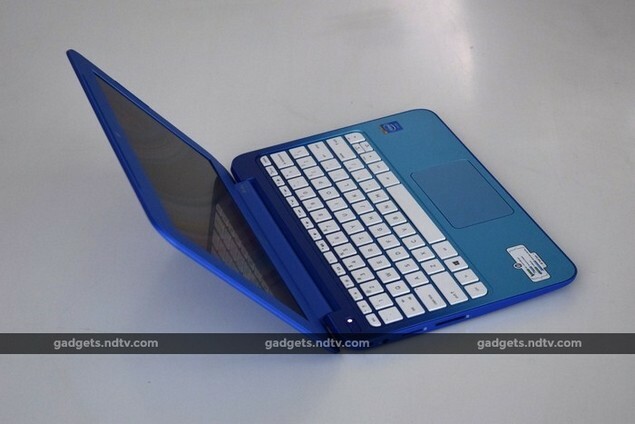 At 1.27kg, the Stream 11 is about as portable as other laptops of its size. Its price is also quite attractive, considering that clamshells are a lot easier to work on than tablets with folding keyboard covers. However, the Stream 11 has a different focus than most laptops, and not everyone will think ditching onboard storage in favour of a SIM card slot is a worthwhile tradeoff. There are a lot of people this device would do just fine for: students, elderly people, field workers, and of course those who choose it for its style. It also seems like just the right balance for basic productivity without distractions, making it an interesting device for schools and colleges. On the other hand, HP might have limited its potential audience with the garish design - it's hard to imagine any large, serious company equipping its entire mobile workforce with bright blue polka-dotted laptops, even if the balance of cost, connectivity and portability is just right. A simple search on any shopping website will throw up a long list of black laptops with better specifications in this price range which are larger and heavier, but a lot more sober. 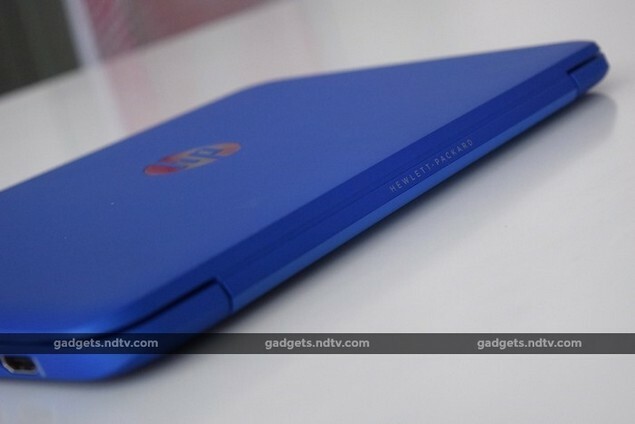 Other alternatives include Chromebooks and tablets such as the Swipe Ultimate 3G (Review) and Notion Ink Cain (Review | Pictures). product HP's new Stream 11-d023tu is designed for portability and connectivity, but at the cost of some traditional laptop features.